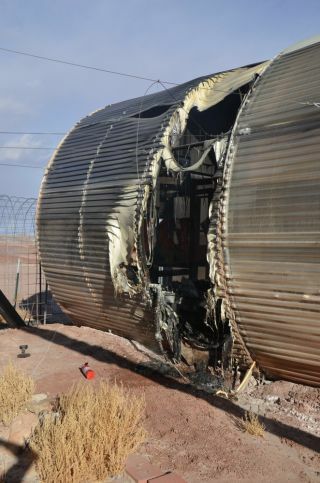 The Mars Desert Research Station's GreenHab was destroyed by a fire on Dec. 29, 2014. The Mars Society has launched a crowdfunding campaign to help rebuild its greenhouse at a facility in rural Utah that was destroyed by a fire last December. The "GreenHab" at the Mars Desert Research Station (MDRS) was deemed unfit for use after a fire erupted during a mock Mars mission in late December 2014. Crewmembers fought the fire and limited the damage. The cause was an electrical heater, and the incident was ruled an accident. So, on July 30, the group launched a campaign via the crowdfunding site Indiegogo. With 28 days to go, The Mars Society has raised about $3,600 of its $10,000 goal. "All the things for plants — for food growth and plant-science studies — we are doing the fundraising campaign to support purchasing that equipment," Nick Orenstein, MDRS GreenHab coordinator and (coincidentally) the commander of the crew that fought the fire, told Space.com. Damage inside the Mars Desert Research Station's GreenHab was extensive following a fire on Dec. 29, 2014. A previous, undisclosed amount was raised from Mars Society donations for the new structure itself, Orenstein said. In January, MDRS Director Shannon Rupert told Space.com that a replacement structure would cost $40,000 but that she was hoping to reduce it to $10,000 through volunteer labor. If the fundraising goal is not reached, MDRS will continue with the current arrangement: a temporary tentlike greenhouse that can host some experiments. The new GreenHab will be a dome roughly 25 feet (7.6 meters) in diameter at its widest point. It is set up fairly close to where the old one was located, but in an area that will better accommodate the new structure, Orenstein said. Not only is the dome structurally efficient, but the fans can be placed more evenly than in a rectangular building, he added. Winds on the site would also curve a little better across the circle than they would on a flat surface. GreenHab team members visited the site last week to clear away the last of the old structure and to prepare the site for the new one. The next major step is to pour concrete slabs to house the dome. A local contractor in nearby Hanksville, Utah, who did similar work for the site's observatory, will perform the work this month, Orenstein said. If the money is raised in time, the structure and its components would be completed in September. The 2015-2016 field season for MDRS runs from October to May, with crews spending two-week rotations on the site.